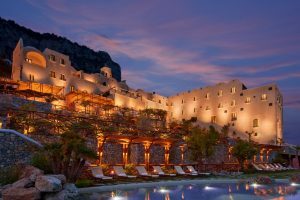 Striking the perfect balance of seclusion without solitude, Monastero Santa Rosa allows guests to determine the tone of their stay, whether they’re looking to disappear for an intimate getaway or gather with the group and make new acquaintances. 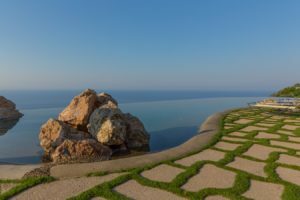 Where most boutique properties might only offer in-room massages, Monastero Santa Rosa hosts a fully equipped spa to rival any major city spa, offering not just treatment rooms, but large-scale amenities that include a sauna, steam, mosaic-tiled experience shower, hydro pool, and tepidarium. Centuries of history behind ancient walls tell a tale of community and the offering of sanctuary, healing and comfort. Each room within the Spa preserves the original 17th Century vaulted ceilings and many of its rustic walls, maintaining the monastic heritage of this beautiful property. The Italian heritage of bathing is presented in the form of a Thermal Suite, consisting of a collection of vaulted spaces inter-connecting the various warm rooms via arched openings & changes of levels… a discovery around each corner. 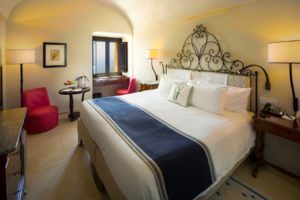 The Suite includes a stunning double-height vaulted Tepidarium with pomegranate infused foot spas & heated mosaic loungers; domed Aromatic Steam Room; crushed Ice fountain to refresh between thermal bathing; Rock Sauna; Hydro Pool and Emotion Showers. 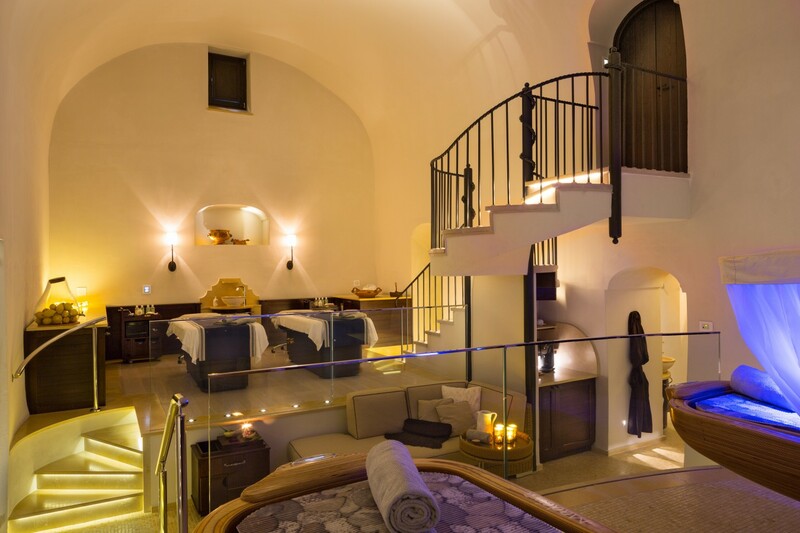 The most exceptional treatment room – the Spa Suite, is a stunning 80m2 double height vaulted space with Rasul; steam room; double wet & dry treatment couches; manicure / pedicure; relaxation lounge; private dressing & grooming space and a garden terrace… a ‘private spa within a spa’. 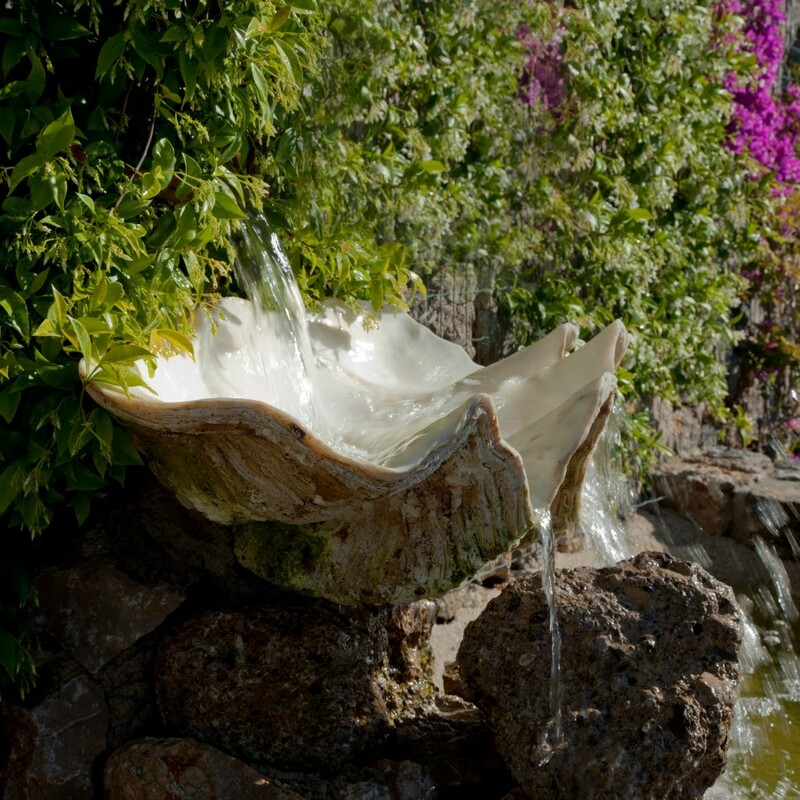 Alternatively, guests can enjoy a treatment outdoors under the shade of a pergola within the privacy of the Treatment Garden, or be cocooned within one of the historic single treatment rooms. Since 1612, Farmacia Santa Maria Novella have provided a multitude of benefits derived from the naturally occurring plants and flowers of Italy and the Mediterranean region, using their ancient and beautiful recipes of fragranced lotions, healing crèmes and balms. The aromatic oils of Santa Maria Novella, summer oil of lemon, bergamot and petit grain, the deeply warm iris oil, aromatic herbs of rosemary, lavender and sweet orange and the unique fragrance of pomegranate, made for Catherine de Medici, are a delight to the senses. All of these wonderful aromas are woven into the timeless and fresh sense of vitality & joy provided by the delightful spa treatments. 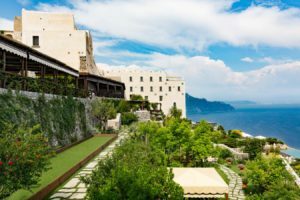 The spiritual enchantment of the transformed monastery remains ever present in the luxuriously converted 20 rooms and suites, each named after herbs that the nuns would have used in making their medicines from the Monastero Santa Rosa garden. 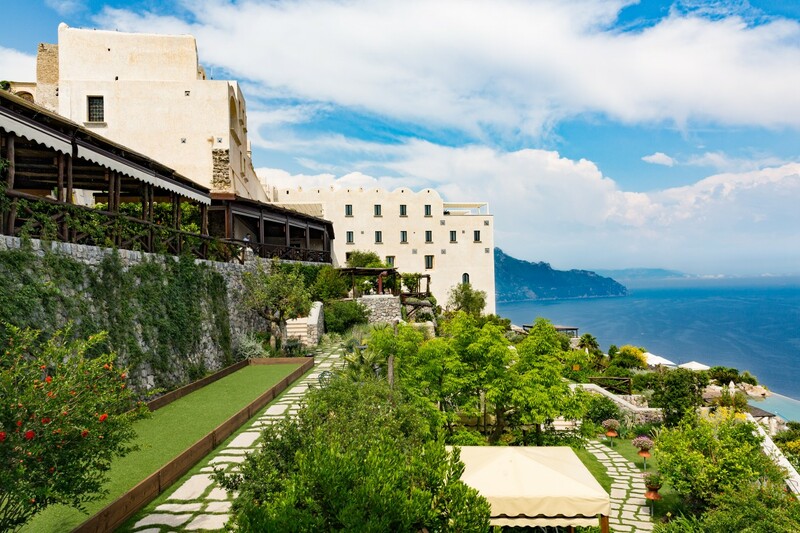 Vaulted ceilings and the primary structure of the nuns’ rooms and refectory have been preserved and linked together with ensuites to create sumptuous bedrooms, each with a spellbinding sea view stretching from the Conca dei Marini’s fishing harbor below to Amalfi beyond. The culinary treats of Santa Rosa are as unique as the monastery itself. 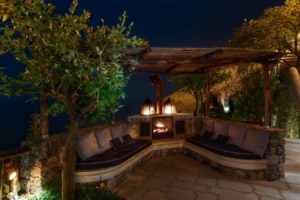 Distinguished Executive Chef Christoph Bob has created an innovative Mediterranean gastronomic experience utilising the freshest ingredients from the surrounding Campania region. 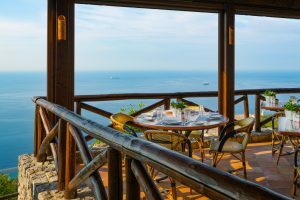 Located approximately 175 miles southeast of Rome, the Amalfi Coast stretches for 15 miles along the Sorrentine Peninusla. Monastero Santa Rosa Hotel & Spa is located approximately 10 minutes from the town of Amalfi, 25 minutes from Positano, 15 minutes from Ravello, and 80 minutes from the Naples International Airport, the region’s most common point of entry. Burn off those calories and experience the natural beauty of the Amalfi Coast by embarking on a guided hike offering some of the most beautiful views of the surrounding area. Accompanied by a local expert, you will be navigated through beautiful, otherwise unvisitable, parts of Amalfi, beginning a 5-minute drive from our hotel (transfer provided by hotel shuttle); during the hike you can enjoy a rustic “table to farm” lunch experience. 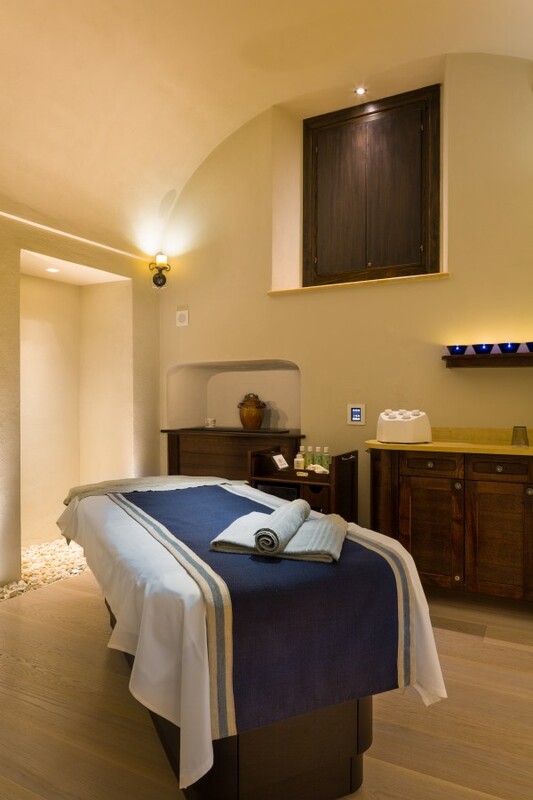 Following this 2-3 hour hike, rejuvenate mind and body with a Signature Arnica Body Wrap Treatment to alleviate those fatigued muscles in our world-class spa featuring Santa Maria Novella products. City Tax, Euro 4,50 per adult per day to be added. *Price shown for couple rate. Can also be booked as individual. We have created collections of treatments that taken together as ‘Spa Days’, offer real benefits and a fuller spa experience. Each collection begins with a fragrant pomegranate foot bath. 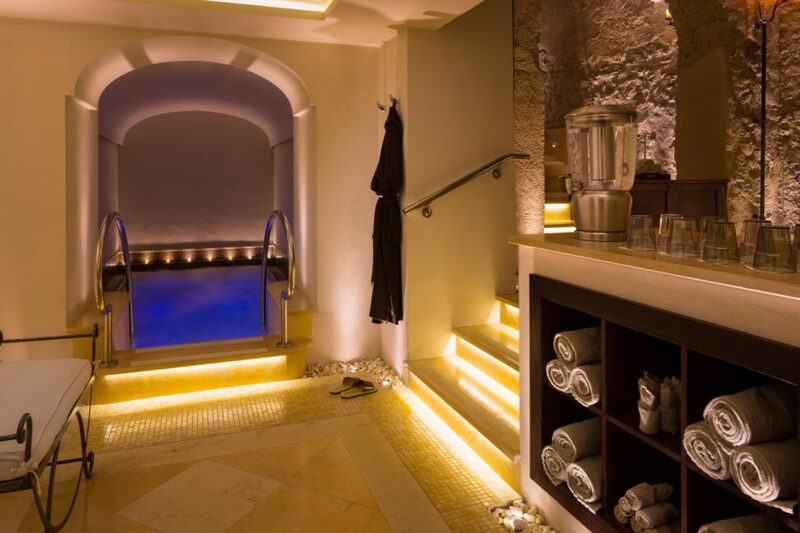 An aromatic steam room or a private Rasul experience is also included according to the collection, along with some time for relaxing and lunching in our beautiful surroundings. Private Spa Suite for two people or more. Allow all day, as there are approximately 4 hours of treatments including the Rasul. Pomegranate Foot Bathing, Rasul, 60 minute Santa Maria Novella facial, 60 minute Spa Massage, Manicure or Pedicure. A full day to share with friends or a special other, the use of our private Rasul, Spa Suite and terrace make this a privately social occasion. Light lunch included. Private Spa Suite for two people or more. Approximately 2.5 hours of treatments including Rasul. 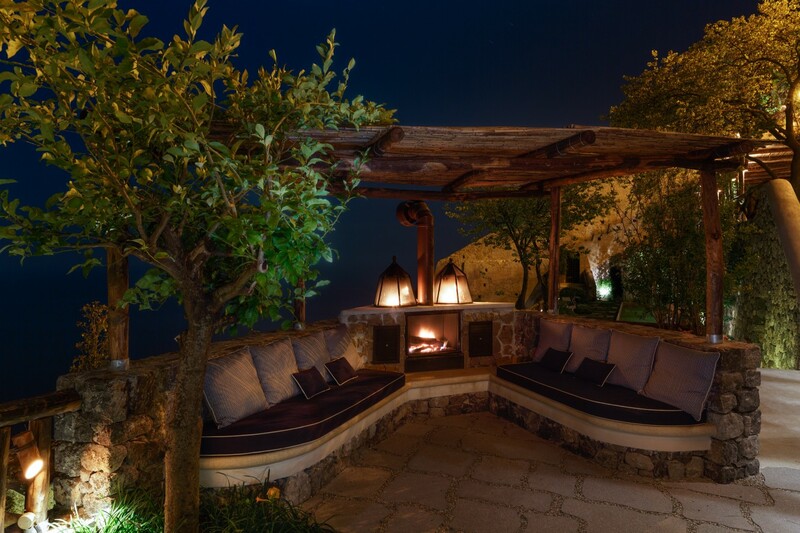 Pomegranate Foot Bathing, Rasul, Aromatic Scrub, 60 minute Santa Maria Novella facial or a 60 minute Spa Massage. A lighter version of our full Spa Day for two. For when you need to relax in company, but have a little less time. Allow all day, as there are 3.75 hours of treatments. Pomegranate Foot Bathing, 60 minute Santa Maria Novella facial, Aromatic Powder Scrub and Spa Life Massage for 60 minutes, a choice of a Manicure or Pedicure treatment. For a complete day of Santa Maria Novella spa treatments that cover every angle, relaxing, refreshing, nourishing and grooming. Full immersion in the Spa for the day with a light lunch included. Approximately 3 hrs of treatment time. 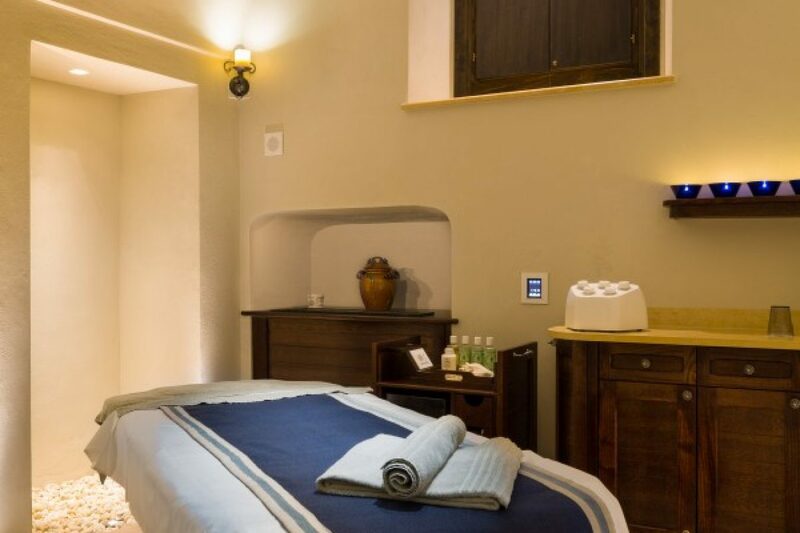 Menthol Salt Foot Bathing, Santa Maria Novella Classic Facial for men, Deep Tissue Massage, A choice of a Hand or Foot Treatment with attention to nails. A day that can be used to recharge, with treatments from his perspective. A light lunch is also on the menu. Approximately 2.5 hours of treatment time. Pomegranate Foot Bathing, Aetas Salubris 75 minutes facial and Iris Drizzle Hydrating Body Wrap. This day is all about feeling good and looking radiant. A warm relaxing Pomegranate Foot Bathing makes an especially uplifting start and it only gets better and more fragrant. A Light lunch is included. 2 hrs of treatment time. Pomegranate Foot Bathing, Body Scrub, Hair treatment, Candle Massage including face, scalp and feet. Traveling and daily stress interferes with our sleep patterns. 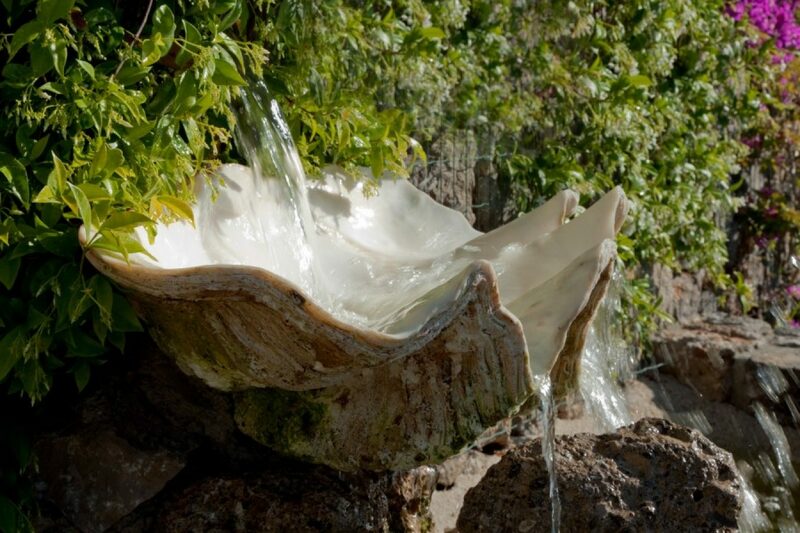 The aim of this treatment is to restore the body’s natural biorhythm and deeply relax the nervous system. The Candle Sleep Massage is a deeply focused relaxing massage with a Santa Maria Novella candle wax made of pure plant oils and prime emollient butters. Lit as a normal candle the wax begins to melt to body temperature and is buffed and layered into the skin with the low and delicate warm scent of spice. Additionally, the scalp and feet are treated with gentle acupressure massage to induce calm and balance. Only light Thermal bathing is recommended prior to this treatment. If you are looking for something a little different or wish to have a collection of treatments that reflect your needs more accurately, our Spa Manager will be happy to organize an individual programme of treatments for you or your guest. Please contact the spa directly on 089 8321199.